Sorry I haven't posted in a while...I've been very busy with lots of things at my work and with school. I just started two new college courses this week: one required geography class, and one English/Lit class on American folklore that seems to be moderately interesting. I am very upset with my geopgraphy class, however. It costs about $1500 and the professor is literally have us color maps like we are third graders. "Remember, rivers in blue, forests in green." Seriously! I am very upset about it, but I'm thankful that it is not that demanding at least. I have also spent a lot of time browsing through the comments on Athanasius Contra Mundum concerning the ongoing debate between Athanasius and apologist Dave Armstrong (which as of now has 38 comments). In the course of the debate, a Sedevecantist showed up who made some pretty serious accusations about women wearing pants. For many of you who have been around, perhaps you've ran into this thing before, but this was my first time encountering the argument. If I understood him right, the Sede was making the argument that it was never permissible ever for a woman to wear pants, no matter what she was doing. If there was some sort of work or labor that necessitated pants, then she ought not be doing the labor in the first place. So, essentially, to wear pants would be a mortal sin for a woman, akin to a man cross dressing. Someone asked, "What about when riding horses?" and this person said that the woman ought to ride side-saddle. 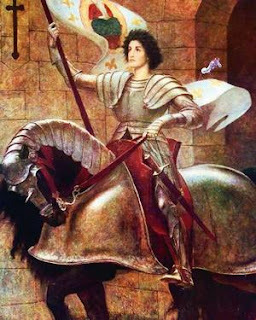 This, of course, brought to mind one famous Catholic saint who rode horses and got her attire questioned as well: I refer of course to St. Joan of Arc. When going into combat, she donned male attire for utilitarian reasons. She was condemned on this account, but after her death, the Church exonerated her, declared her trial illegal and canonized her in 1923. Would not the fact that St. Joan is a canonized saint be an irrefutable argument against the position that it is never permissible for a woman to wear pants? Otherwise, how could the Church canonize somebody who did what would be considered a serious sin? Does anybody have any input on this? If women are to wear pants when necessary they should be modest pants (very loose etc) not the constant tight pants I see on girls age 7-60. Should we consider robes, tunics, and kilts to be crossdressing? Obviously culture and context IS relevant, so any absolute statement on the supposed 'sinfullness' of women wearing pants is ridiculous. Better to discuss a)modesty and b)intent. That's a wonderful point...I thought about kilts myself when I was writing this. I've always preferred Roman dress myself, I HATE PANTS. A nice flowing toga over a white Tunic which drops to my knees sounds good to me. Too bad it is out of dress code at work! The fact is Roman culture considered pants barbarous, as did most Mediterranean civilizations. Neither men nor women wore them. An argument for men to wear them is an argument for women to wear them, it is as Alexander said, they must be modest. The same is true for men, we too must be modest, although women are far less visual in that regard. Men's modesty mostly consists in not flirting or coming on to women whom you have no real interest or when you are married. Too often I have met so-called "trads" who make their wives wear skirts but go about in jeans and a t-shirt and hit on women in the grocery store. boniface - you were probably not hanging around campus the day that one of my friend's mothers came and gave a talk on modesty. She thought that pants were immodest on women because it makes a woman look sexually 'available' by drawing attention to the crotch. I've had many a good laugh since then about how much more 'available' a woman is in a skirt, particularly a nice flowing one. That particular speaker has since gone off the deep end and left her family. One imagines that her particularly severe ideas on rectitude may perhaps have clouded the difference between essentials and non-essentials? In any case it is interesting to witness discussions (often mostly between men) about the sinfulness or rectitude of woman's attire. As Athanasius observes, men sometimes forget that they too are called to modesty.